Is Spotify Discover the music-social mashup we’ve been waiting for? It seems like the formula could not be more ideal: Take music, make it social, profit. Music is inherently personal. People love to share it. Even bystanders participate as they listen. As a concept, it seems perfect – but in practice, it has so far proven otherwise. We’ve witnessed more missteps than worth listing; many have tried and many have failed. More accurately, many have experienced flickers of short-lived success followed by (generally) a place in Web obscurity: Turntable.fm, Rdio, MOG, – need we even mention Ping? Sure, they’ve had varying degrees of success, but the true music social network remains beyond our grasp. Or is it finally here? We went hands on with Spotify’s new Discover feature to see if one of the most popular streaming music services has finally cracked the code to doing social right. Did the Discover hub make you do a double take? Is there something familiar about it you can’t quite put your finger on? That’s because it’s like the new Myspace’s uglier, more functional cousin. When Myspace launched back into the limelight – much thanks to one Mr. Justin Timberlake’s mug all over its landing page – it attracted a lot of attention for how beautiful it is. And beautiful it is. The horizontal scroll, the large, Pinterest-like take on images, the auto-appearing search function; it’s all stunning. Of course, sometimes innovative design is alienating, and users find themselves overwhelmed and confused by a service. Such has been the case for Myspace, though it’s something the site continues to address with updates, added functionality, and of course user growth. 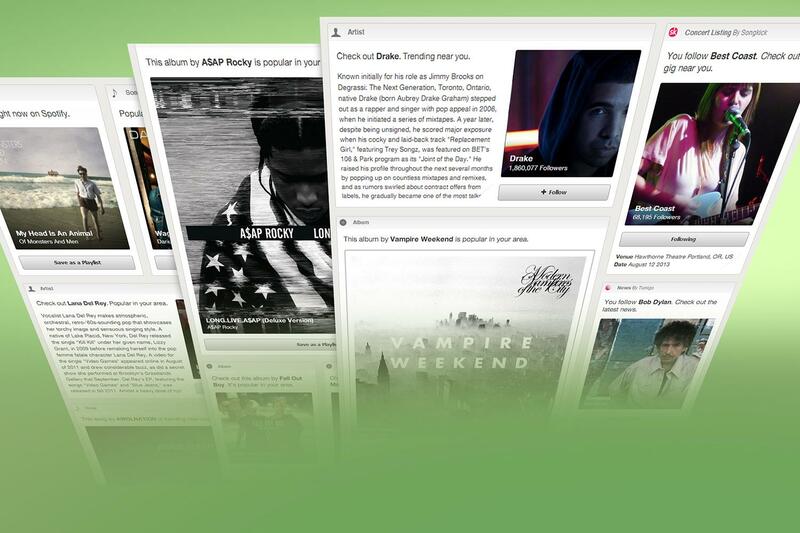 Still, Myspace is more beauty than brains at the moment – and Spotify is trying to find the happy medium here. But we want it all, or at least we should. 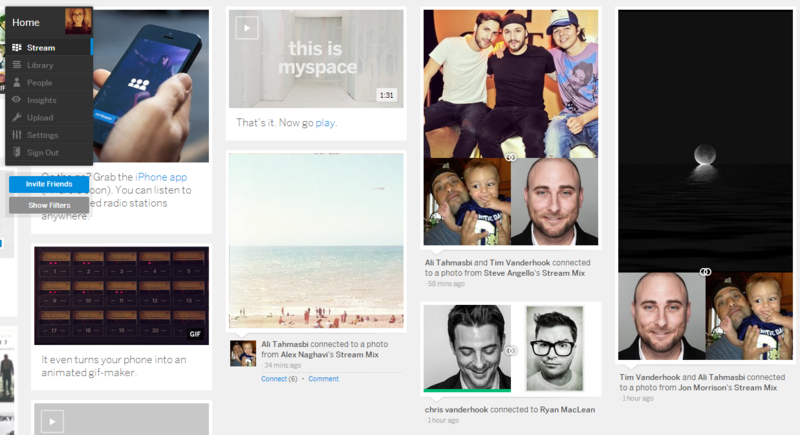 I want something as beautiful, immersive, and versatile as Myspace, but with Spotify’s functionality, ease of use, and intuitiveness. So while the layout is familiar and far more interesting than the old default Spotify hub, it doesn’t appeal to our basic human instincts. I might not be a Pinterest fiend, but I get why people are: Because they don’t want to look away. Does Spotify Discover … discover? 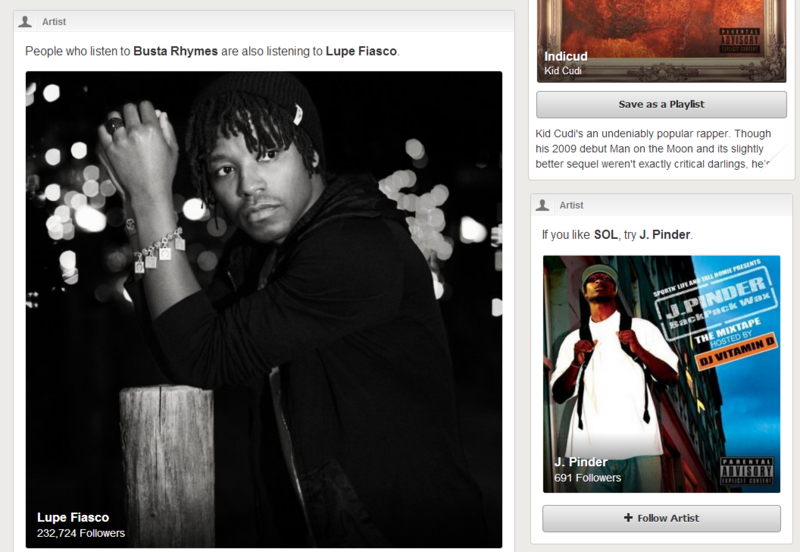 I’ve long lamented the state of Spotify discovery. Of course “long” is a fairly relative statement: Spotify has been around for little more than a year now, and since then I’ve been a loyal and active user. I like the desktop software and its iTunes-like UI combined with a built-in, deep catalog of music. The Web app is similarly nice, though I seldom use it. The mobile app does just about everything I could ask it to. My major – really, only – complaint has been music discovery. Pandora remains on top of this, the new Myspace is fairly impressive, and Google’s latest venture also proved more able than Spotify to find me new music I actually want to listen to (jury’s still out on iTunes radio as we haven’t be able to try out the new service yet). Spotify Radio has been an overwhelming disappointment (as evidenced by the sad state of my “Like from Radio” playlist), so when the music network launched its new Discover dashboard, I was more than ready to jump in and … start – fingers crossed – discovering. A quick look at Discover reveals a much nicer-looking hub. The strange scroll of featured apps, popular music, and new additions to the catalog was never a very welcoming sight and most of us jumped right into our already-created playlists or started looking up new tracks (…or resignedly headed for Radio). Now, Discover gleans data from your listening habits, your friends listening habits, as well as other data (playlists you’ve followed, music you’ve shared or liked). When you boot up Spotify, you’re greeted by suggestions – in plain English. “You listened to SOL. 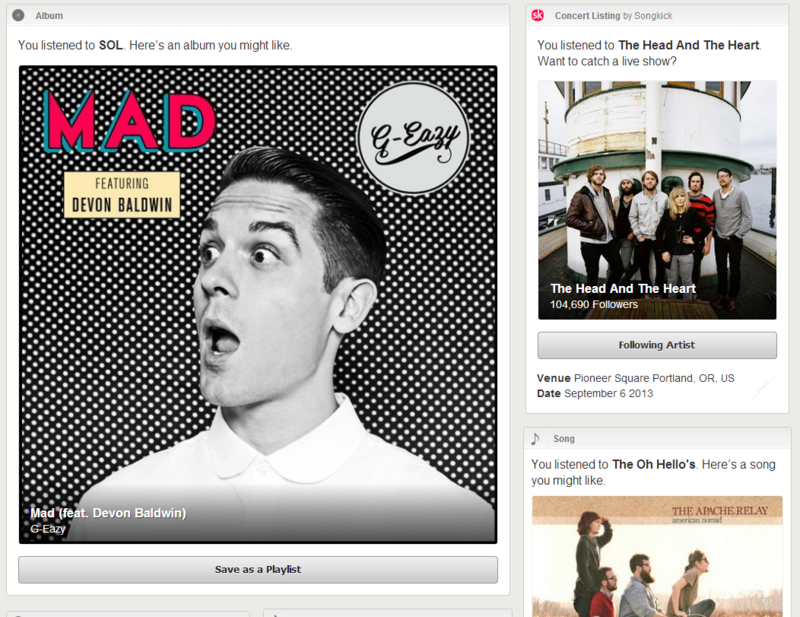 Here’s an album you might like,” Spotify says, prompting me to listen to an album from G-Eazy. “You listened to the Oh Hello’s. Here’s a song you might like,” Spotify says, referencing a song by The Apache Ready. In addition to song and album suggestions, Spotify pulls from its Songkick app to tell me when acts I like are in the area. Sometimes it tells me I should follow a certain artist, or says it’s been awhile since I listened to a song I previously had on replay. It’s all very natural – and the best part is the infinite scroll. The personalized prompts and suggestions just keep coming. And if you don’t want to out and out commit to listening to a song, you can hold to preview. Here’s the thing: This all works and it doesn’t work. If Discover’s goal is to keep me clicking and testing songs and artists and to keep on scrolling and scrolling, then Spotify’s nailing it. If the goal is to find new music I really like, it feels very much like throwing mud at a wall and seeing what sticks. It is, however, more effective than Radio: In one day of using the Discover hub, I like almost as many songs as I’ve liked from Radio after months of use. In all of this, the same thing that’s always missing from the attempts at a music social network remains missing: A working social community. Spotify is easily the closest thing right now, but there are various missed opportunities for peer-to-peer interaction. I watch my friends listening activity feed into Spotify, but I’m not able to thumbs up or comment – and sometimes I want to (“Yeah! I like this little-heard-of band too!” or “Weird, I know the lead guitarist of this group”). When I go to one of my friend’s pages, the only options for interacting with them is to follow or send music. I can’t leave notes or messages about someone’s playlist. On the subject of playlists: The idea of making a collaborative Spotify playlist should be … ya know, collaborative. How about a Google Drive-like feature where you can chat with the other users inside a playlist so that the swap-and-drop of disagreed-upon tracks doesn’t turn into an all-out, silent war? What Spotify has created is the closest thing to a music social network we’ve ever experienced, but it’s silent. We’re in there, playing music, finding music, looking at what others are doing, but it’s all quiet on the social front because we have a very finite amount of ways to interact with one another. The verdict: Spotify’s shot at a social music platform is a good one – it’s just barely off the mark. The music social network continues to elude us, but from the looks of it, it won’t be able to much longer.